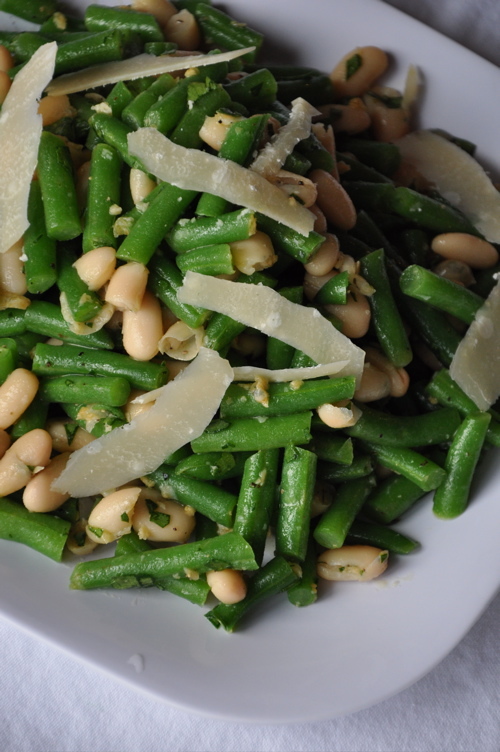 Served cold or warm, the crispness of the green beans and the creaminess of the cannellinis make for a filling yet refreshing dish. A perfect vegetable side for the summer. 1.) Bring a large pot of water to a boil. Salt generously and add green beans. Cook until vibrant green yet still crisp; 3 minutes. Drain, and plunge into a bowl of ice water for a minute or so to stop the green beans from cooking any further. Drain. 2.) Combine green beans, cannellini beans, parsley, salt, and pepper in a medium sized bowl. Set aside. 3.) Heat oil in a small skillet over medium-low heat. Add garlic and rosemary and cook, stirring constantly, until garlic becomes fragrant; 30 seconds. Add to beans and stir to coat. 4.) Using a vegetable peeler, shave cheese over salad, and serve. 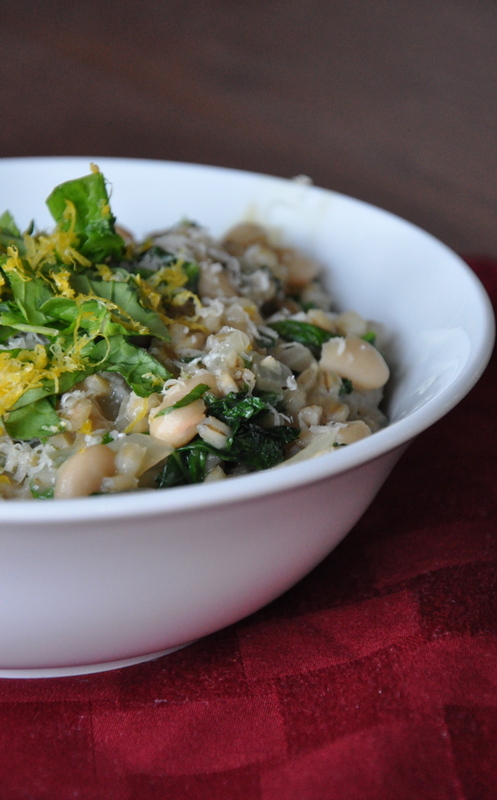 Have you ever tried a barley risotto? If not, you are in for a treat. As an eternal devotee to the wonders of Italian cuisine, I don’t think it gets much better than this. This is a wondrous dish – hearty, healthy, vibrant, refreshing, green, and amazingly delicious. Easily one of my favorite things that I’ve made so far this year. Trust me, this is a dish that you will come to crave. You will also love that you can go for seconds (and thirds!) without feeling too much guilt – barley is packed full of fiber (both soluble and insoluble), protein, copper, antioxidants, and vitamins A, B1, B2, B6, B12, C, D, E and K. Whew! But most importantly, it tastes SO GOOD. As in, I don’t at all prefer regular Arborio rice-style risotto over barley risotto. If you haven’t cooked with barley before, be forewarned that it is a very thirsty grain, and the copious amounts of liquid and stirring in this recipe are quite necessary for the perfect end result. Do feel free to change up the beans, greens, and herb combination – the possibilities are endless. 1.) In your widest heavy-bottomed skillet (not nonstick), heat the olive oil over medium heat. Add onion, marjoram, and a few pinches of salt, and cook for about 10 minutes; or until onion begins to take on some color and the bottom of the pan is beginning to collect some delicious browned bits. Meanwhile, gently heat your stock in a small saucepan so that it is nice and warm, but not simmering or boiling. 2.) Once the onions are nicely colored, add barley and cook for several minutes more. 2.) Add white wine to deglaze the plan, and scrape all the browned bits from the bottom of the pan with your wooden spoon. 3.) Now we begin the long (yet immensely satisfying) process of adding the liquid. Add 1 cup of stock and stir until fully incorporated. 4.) Continue adding stock and stirring frequently by 1/2 cup at a time, making sure to let the barley absorb each 1/2 cup before you add the next. 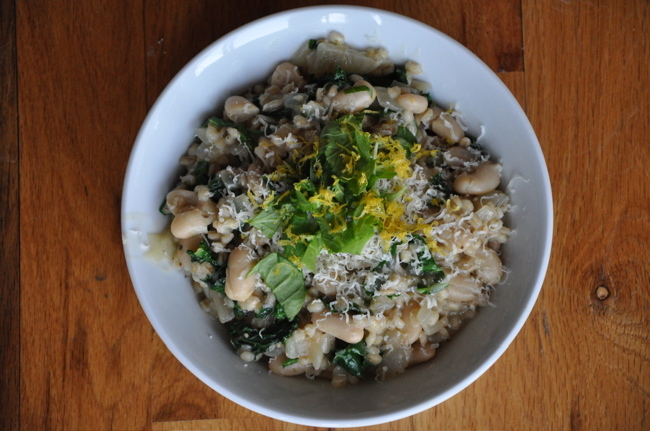 If you add too much liquid at a time, the risotto will not come out as intended. You will have between 6 to 8 additions. I used 3 1/2 cups of stock, but you may wish to use more if you prefer a “looser” risotto. 5.) Once all of your stock is absorbed and the barley is pleasant to the bite, season with salt and pepper to taste. Stir in the cheese and butter. Then stir in the beans and greens. Cook until greens are wilted; just a few minutes. 6.) Remove from heat, and stir in the lemon juice. To serve, divide between 4 plates (or 2 if you are habitually hungry). Sprinkle each serving with a bit of chopped arugula, and loads of lemon zest and cheese. Ask me my favorite chef, and I will abruptly and gleefully shout, “DEB MADISON!” The woman, simply put, is a genius. Though her cookbooks are vegetarian, she has been known to indulge in meat, and thus fully comprehends the full spectrum of flavor that a dish needs. You have never tasted a soup as flavorful as one of Deb’s – they are simply unmatched by anything I’ve ever ordered/made/tasted/dreamt about. 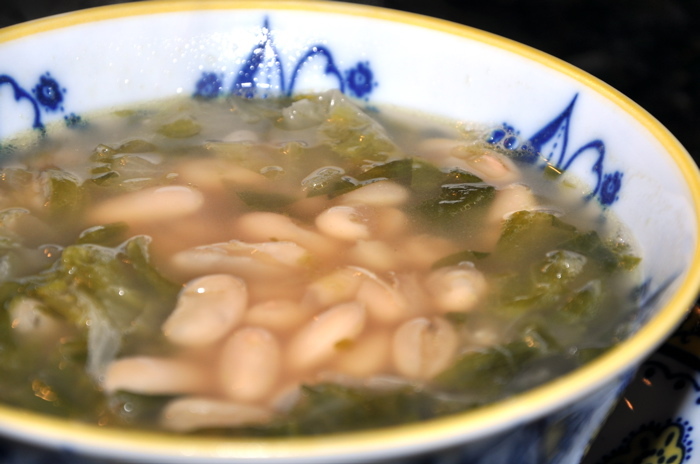 The basis of her deep levels of flavor come from her fondness of stocks, or in this recipe’s case, the bean stock composed of the bean’s cooking water as well as dried herbs and “aromatics” as she calls them. That’s another thing I love about her – the way she writes about food is poetic without veering into pretentious territory. Her cookbooks are brimming with her musings – musings that both inform and delight – and that clearly come from a lifelong passion. Her cooking is infectious – and begs you to push yourself in your own cooking. Oh, and the next time someone rips on Italian food and groans about how unhealthy it is, whip out this recipe, ok? 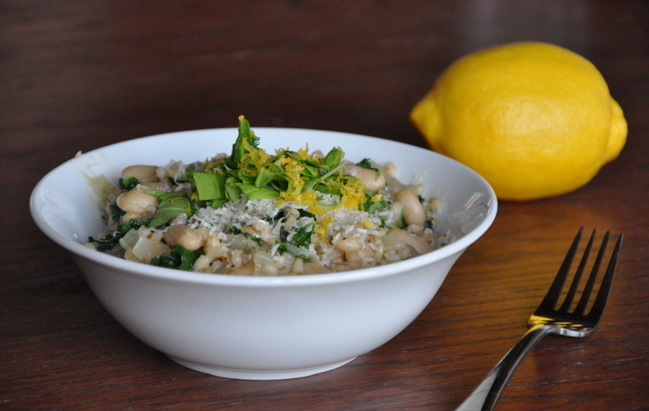 Cannellini beans, farro, and kale – all staples of the Italian kitchen – convene in this wondrous pot of nutritional, not to mention culinary, delight. Literally, one of the most flavorful, satisfying soups you’ll ever make. 1.) Drain beans and place them in a large pot with 11 cups of water, garlic, sage, bay leaves, and parsley branches. Bring to a boil, reduce to a simmer, and cook for 30 minutes, then add 2 teaspoons salt. Continue cooking until beans are tender; about 30 minutes to an hour, depending on how old your beans are. When beans are done, remove from heat, pick out garlic and parsley branches, and leave beans sitting in their liquid. 2.) Drain beans by placing colander atop a large bowl to catch their liquid. Remove parsley branches. 3.) Grab your trusty dutch oven and heat the olive oil over medium heat. Add the onions and cook for 10 minutes; until soft and beginning to get all brown, fragrant, and delicious. Add garlic, carrots, celery, and herbs. Cook for another 15 minutes or so, stirring frequently and reducing the heat slightly, if necessary, to ensure that nothing burns. 4.) Work the tomato paste into the the vegetable mixture and continue stirring until the bottom of the pan becomes glossy and brown. Add wine to deglaze the pan and use your wooden spoon to scrape up all the yummy browned bits. 5.) Drain the farro and add it to the pot along with the kale, tomatoes, 1 teaspoon salt, and the pot of the beans and their liquid. 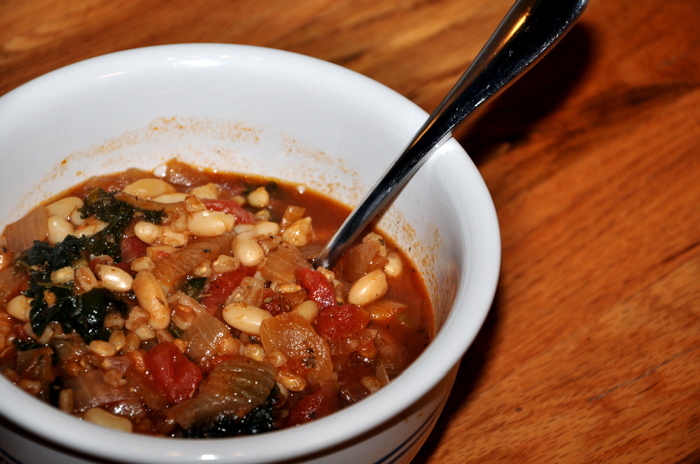 Bring to a boil, reduce to simmer, and cook until farro is tender; about 30 minutes. 6.) Season with more salt, if necessary, and pepper. Serve with a chunk of rustic, peasanty bread. This recipe was adapted from Vegetable Soups by the grand dame of soups, Deborah Madison. Published by Broadway Books; February 2006. A more humble, nourishing supper you will not find. Works wondrously alongside fettucine with homemade tomato sauce. Classic. 1.) Heat oil in your Dutch oven over low-medium heat. Add garlic and saute for about a minute, stirring constantly throughout. 2.) Add escarole, in batches if necessary, stir to coat with the oil and fragrant garlic, and continue to cook until wilted. 3.) Add beans, broth, chunk of Parmesan rind, and the salt and pepper. Simmer gently for 20 minutes. 4.) Season to taste with more salt and pepper, if necessary. Serve with good bread. 1.) Grab your trusty Dutch oven and heat the oil over medium heat. Add the onion, and saute for 5 minutes. Add the garlic, carrots, celery, and pancetta. Saute for 10 minutes. 2.) Add the chard and potato and saute for a few more minutes. 3.) Add the tomatoes and rosemary, and simmer for 10 minutes; until tomatoes break down. 4.) Meanwhile, puree 1 cup of beans with 1/3 cup of the broth in a food processor or blender. 5.) Add pureed bean mixture, remaining broth, and parmesan rind. 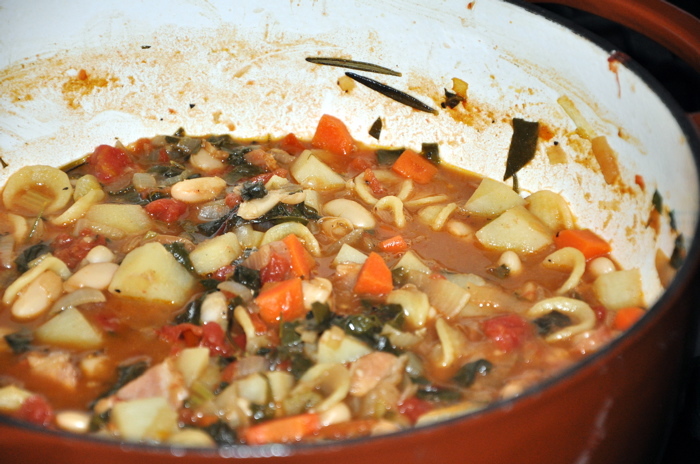 Simmer for 10 minutes, add the dried pasta, and continue simmering for 10 minutes more. 6.) Add the remaining beans and parsley, and simmer for another few minutes. 7.) Season with more salt and pepper if necessary, discard the rosemary sprigs if you used fresh, and serve soup sprinkled with parmesan cheese and a nice big piece of crusty bread.